If you would like to start from scratch with only the time off requests and locked shifts, you can recreate the schedule. Select the 'Scheduler' tab and click on the 'Manage' button from the ribbon menu. Click the schedule you're working on in the drop down menu. Then, click the check box next to the working revision. You can only recreate a 'Working revision', 'Requests' or 'Draft' version. You will need to select the version, workload and priority requests, and confirm to proceed. Lastly, click the 'Save' button. Locked shifts and shift and time off requests will be preserved. 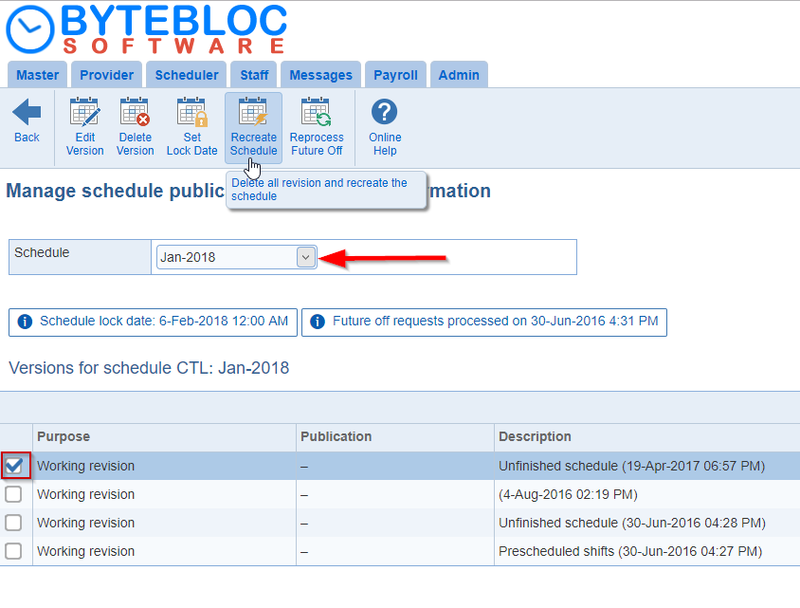 The new version will be called, 'Reinitialization of schedule'. 'As-scheduled', 'As-worked', and final revisions cannot be recreated. A schedule can be recreated when it has only working or request revisions. See 'Workload and priority requests' for more details regarding this feature.